You are doing what to your eyebrows?! Tattoos on your face?! Welcome to 2017 where tattooed eyebrows are taking over the world. It’s not as scary as it sounds, I promise! The world “Microblading” has been a major buzzword flying around the beauty and fashion world lately. 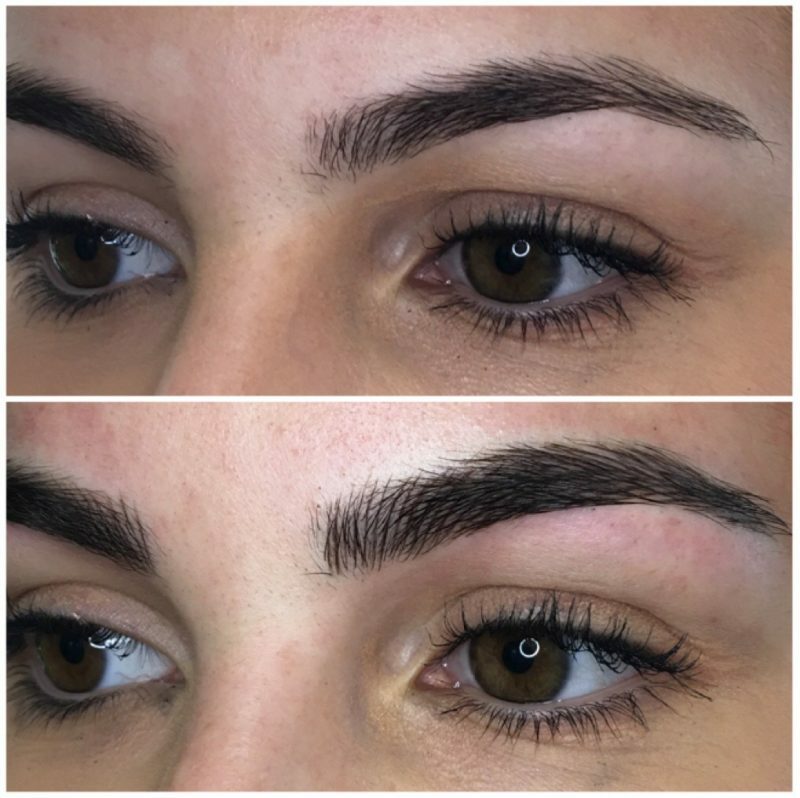 Honestly at first I thought it was some sort of weird facial but thanks to google it turns out microblading is a semi permanent tattoo that is created by a tiny needle that helps deposit pigment underneath the skin-who knew?! So, back to my remarks before…tattoos on your face?! Yes, it’s a scary thought and honestly it took me awhile to decide that I was going to try it. I don’t have any real tattoo’s so (semi) permanently marking my skin, let alone my face, brought some concerns, as I’m sure it does to you as well if you haven’t done it yet either. I had all of the same questions and concerns you did so I am going to answer them all below and I have also included my before and after! 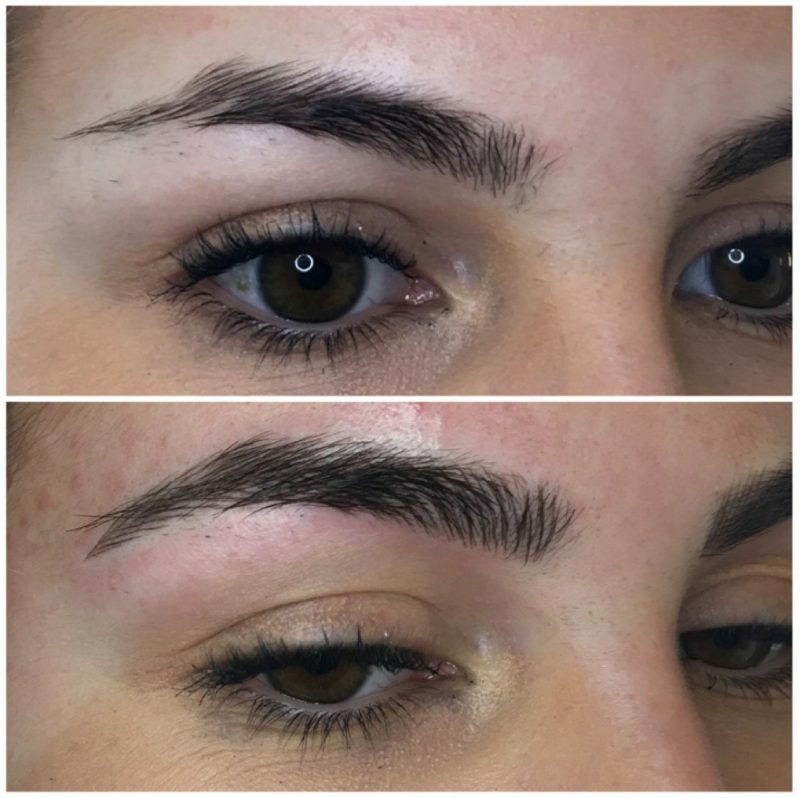 Why did you decide to do microblading? I have decent eyebrows naturally, but they were patchy in areas and I lacked a tail on both sides, especially on my right brow. I would spend at least 10 minutes a day filling in, reshaping, and half the time over correcting my brows to the point where it became a daily chore. My brows were something I could never leave the house without doing so I would always have to allot time for them in the morning. There were even days where I would look in the mirror and realize they were either A) way too dark or B) not even matching #fail. After pulling the trigger and deciding to get my eyebrows microbladed I honestly don’t think I could go back to doing them everyday; I wake up and they are already perfect. I went to Permanent Appeal in Bellevue. After researching for days and seeing her before and after photos on instagram (because obviously that’s when you know it’s good) I knew Jacqueline was my gal! I could go on and on about how amazing she is and how professional and meticulous she is with her job, but I think I would give an underwhelming review. My brows have never looked better nor would they look better if someone else did them. Period. P.S If you are wanting to schedule with her do it asap to get on her books because she is always booked out! Book here or DM her on Instagram. So I went into it expecting the worst. I had heard some stories and watched those videos online so I was prepared for it to hurt like a b*tch. To my surprise I actually barley felt any pain. She numbs you with a topical numbing cream which sits on your brows for about 15-20 minutes and honestly it didn’t bother me whatsoever. I guess some people don’t like the sound of it, but that also didn’t bother me. It’s a weird feeling at times; it feels like scraping on a thicker version of your skin…if that makes sense at all. Does it work for all brow hair colors? So I naturally have really dark hair so my brows are obviously really dark as well but that doesn’t mean yours would be the same darkness. Jacqueline actually mixes a your color to match exactly with your brow hair so you don’t have to worry about them being too dark and fake looking! What is the processes like? The first step is to map out your brows and get an outline to ensure the perfect shape. Jacqueline actually marks the outline on your brows to use as a guide and to show you before the process begins. After that is done a topical numbing cream is applied to your brows for about 20 minutes. During that she mixes a unique color that matches your brow color. Typically there are two “passes” she does where she goes over both brows twice. Basically what happens is that she makes small incisions into your brow (hairlike strokes) and then the pigment is pushed into the skin. 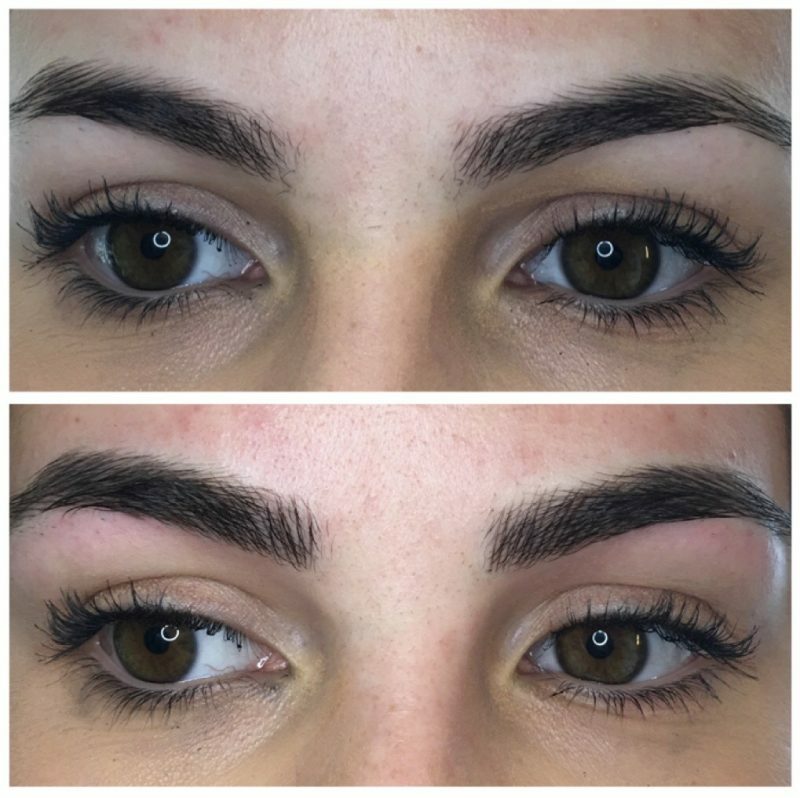 The actual microblading part lasts for about 45 minutes to an hour depending on how much you have to fill in. How do I take care of them after? There is a four week process after your first session. The first week you will notice they might be much darker than expected-it’s okay they will lighten up, don’t freak out! During this week you can’t get them wet via shower, swimming, cleansing, and you also cannot put makeup on them. Your job is to blot them daily. The second week you will notice they might start peeling and are a bit patchy-don’t freak out (again), this is normal. You can start to gently wash and cleanse them like you normally would. The third and fourth weeks they will begin to look like how they actually will look and some people opt to fill them in still (I actually didn’t do that). After the fourth week you go back in for your second session which is to touch them up and make sure they are just how you want them. How often will I have to touch them up after the second session? Depending on your skin type and how you take care of your skin, typically you will get them touched up every 1-2 years, some brows last longer and some not as long. Dryer skin (like mine) actually holds the pigment better than oily skin. If you have oilier skin you may have to come in every 6ish months to get touched up. At Permanent Appeal the cost is $550 with a free touch up session 4-8 weeks after. All touch ups after the initial session are $250. Why in the world did I not do this sooner? !